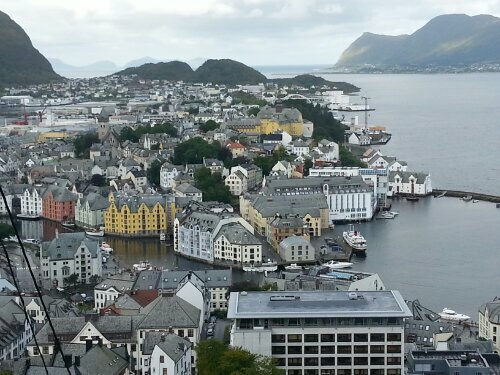 Alesund, Norway greets us just like Bergen did…with rain and temps in the mid-fifties. I have to admit that I bought the HOHO tickets for this stop as there didn’t seem to be much to do here…this is even more apparent when the cruise director announces that it is Sunday, so no shops will be open. 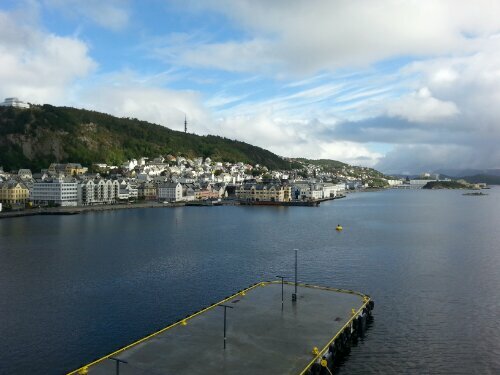 Bergen had a lot to see within walking distance of the ship and had a distinct city center that Alesund seems to lack. Going to the top of Mt Aksla or visit the aquarium seemed to be about it. However, as I didn’t use the HOHO in Bergen, I didn’t realize that I needed to turn in my e-ticket at the ticket counter before boarding the bus (in Bergen I never even saw a ticket counter). So we got on the bus only to be kicked off. The next bus is 30 minutes away, so we walk over to an open petrol station hoping to get a magnet. No go. I spy an open 7-11 and go there, but also fail. DH then says that as it stopped raining when we got off of the ship, he’d rather hike to the top of Mt Aksla than wait for the bus. So off we go! It’s 418 steps to the top, with plenty of places to stop and take pictures (or rest!). It occurs to the both of us that there is a building on the top of the mountain which is bound to be open, and it is. Yay, we’re able to get our fridge magnet for a mere €7. A bottle of water costs and additional €5.50. Believe it or not, I really don’t mind this as the euros I have are left over from the last trip and I have nowhere else to spend them! Something to note here. Both in Bergen and Alesund use of a toilet is 10 kroner. Now of course no one has 10 kroner coins. Most of us are using credit cards whenever possible. The bathroom at the top of the mountain in Alesund accepts 1 euro coins as well. Just something to be aware of! After our climb we go back to the ship where it promptly begins to rain again. Our timing is perfect two days in a row! Now we’re bouncing between rain and sun. Norway, like New England, seems to hold to the mantra, “If you don’t like the weather, just wait a minute”. Great pictures there! I really enjoyed Ålesund on foot when I came with Hurtigruten in the 90’s. Does the Star dock far from the city? I just hope that you didn’t bring too many Euros, since there is no port in the Euro zone (!) We’re really eager to follow your blog and read about your adventures on your stops and about the cruise on the ship. Right now we’re preparing for our X-mas cruise on the Epic, but this time next year we’ll be on “your cruise” visiting Bergen, Ålesund and the Atlantic islands. The Star docks in near the city in all instances so far (except the Shetland Islands where we tendered). Only brought about €30 that I happen to have left over. So far, both stops in Norway have had places that accept them.